Old-fashioned, buttery, and full of coconut flavor, these are my new favorite oatmeal cookies. A few months ago I came across an oatmeal coconut cookie recipe that sounded so good I immediately pushed it to the top of my Want To Make list. The cookies didn't live up to my expectations, so I decided to come up with a recipe that did. These thin, chewy cookies are easy to make and hard to stop eating. As we munched on the first test batch, my hunky farmguy Joe and I talked about adding all sorts of things to the batter—chocolate chips, raisins, dried cranberries, dried apricots, almonds—but decided we loved them plain. They taste even better the next day, and they freeze beautifully. If you've never tasted natural, unsweetened shredded coconut, you're in for a real treat. The coconut flavor really comes through, and unlike the highly processed sweetened stuff, it doesn't contain preservatives like propylene glycol and sodium metabisulfite. If you can't find unsweetened coconut at your supermarket or natural foods store (check the bulk section), you can thankfully order it online. I've been buying Bob's Red Mill brand, which is about $12 for four 12-ounce bags at amazon. It tastes great in baked goods (like this scrumptious Lemon Coconut Quick Bread), and you can also soak it in warm water and use it in place of fresh coconut. I even toss it in our morning smoothies. Unsweetened coconut keeps best in the refrigerator or freezer. A couple of heavy duty commercial rimmed baking sheets are a great investment, and at about $12 each, one of the best kitchen deals around. Treat them well—I usually line mine with sheets of unbleached parchment paper, which is wonderful stuff—and they'll last for ages. I've been using the heck out of some of mine for 20 years for everything from baking scones to roasting Brussels sprouts, not to mention baking thousands of cookies. It's easy to make nice round cookies if you portion out the dough with a scoop. I own five or six different sizes and have had some of them for 20 years too. For these cookies I used a 1½ Tablespoon scoop. I also made some using an Oxo Good Grips small 2 teaspoon scoop (putting 20 cookies per baking sheet), but preferred the larger size. Ingredients vary, and how much your cookies spread will depend on the oats, flour, coconut, and even the brand of butter you're using. The weather can affect baking, too. I've made several batches of these, and no two have come out exactly the same (although they all taste great). For slightly thicker cookies, omit the 2 Tablespoons of milk. If you want the cookies to spread a little more, add another Tablespoon or two of milk to the batter. As always, I urge you to seek out local and organic ingredients; they really do make a difference. Organic flours, organic rolled oats, and organic sugars are readily available these days. Look for farm fresh eggs like these beauties laid by our hens at your local farmers' market (find one by searching on LocalHarvest.org). You won't believe how good they taste. Melt the butter and place it in a large mixing bowl. (I melt my butter in a large stainless steel mixing bowl set right over the lowest heat on a gas oven burner, then add the rest of the ingredients to it). Using a large rubber spatula, stir in the brown sugar and granulated sugar. Add the vanilla, milk, and eggs and stir until well combined. Add the flour, baking soda, salt, and cinnamon and stir until blended. Stir in the oats and coconut. Using a 1½ Tablespoon round scoop, drop the cookies onto the prepared baking sheet (I put 12 cookies per sheet). © FarmgirlFare.com, the coco loco foodie farm blog where Farmgirl Susan shares recipes, stories, and photos from her crazy country life on 240 remote Missouri acres—and there are always cookies on the counter and/or in the freezer. I never thought of adding coconut to oatmeal cookies before, YUM!! These sound perfect! Love the idea of unsweetened coconut and I have some here from Azure Standard. I'm going to replace the brown sugar with coconut sugar & will let you know how they turn out. Thanks! I love oatmeal cookies and these sound even better. Never seen this type of coconut before here in the UK, usually use the dessicated kind which is also unsweetened. What a great article. Thanks so much for the link. I love hearing how other sheep farmers are cutting their coyote losses by using livestock guard dogs. I know ours have made a huge difference. I like Bob's Red Mill products. I buy their whole wheat pastry flour and use it in place of all-purpose flour for just about everything. In fact, last night I baked oatmeal chocolate chip cookies! Just baked them yesterday and they are delicious! I added mini chocolate chips to half the dough and they were a hit. I love your cookie recipes....please keep them coming. I love the container that you used to photograph the gorgeous cookies. It looks retro... love nautical and anchor things!! Isn't that just the cutest little dish? I saw it last fall in an antiques/junk mall and simply couldn't resist. It's probably from the 1940s, though I haven't researched it yet. With that motif, it might be from the 1930s. Check out Anzac biscuits, they're a tradition in New Zealand and Australia. There are quite a few recipes online. They're often crunchy because they were made to send to soldiers at war so needed to last long journeys, but I prefer mine chewy. These were delish! I added some butterscotch chips and spread out the dough on a half sheet jelly roll pan in a pseudo rectangle (the dough didin't touch all sides). I was too lazy to make batches of cookies and I needed to eat some fast! I love texture and flavor the coconut gives! 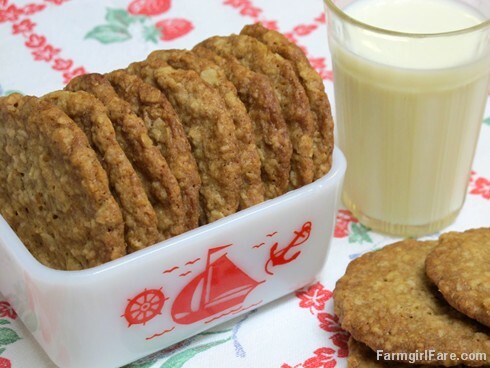 This oatmeal coconut cookies recipes is amazing. I'm wondering if it is still delicious with sweetened coconut. I was hunting for an oatmeal sandwich cookie recipe, and the melted butter in this makes for a perfect flat-ish cookie! I cut the sugar by 1/4c and put salted caramel between two of these delicious cookies and it's safe to say it was a bite of heaven :) Thanks for yet another fantastic recipe!